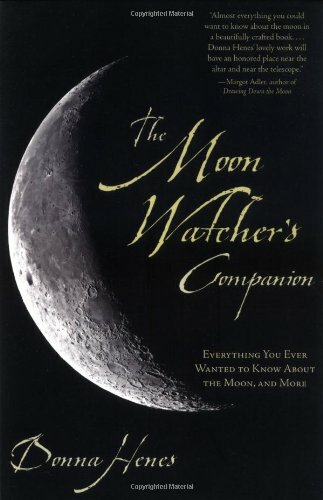 Donna Henes, New York City's Urban Shaman, has made an important contribution to the literature of the night skies with her "Moon Watcher's Companion." This beautifully-designed gem of a book is a visual delight that will be enjoyed by children of all ages as well as curious adults. In it, Henes effortlessly weaves scientific, mythological, and poetic information in an easy-to-read format that is chock-a-block with fascinating facts and stories. Buy this book and share it with your friends and family! Carl's latest book is much the same in format and tone as ``Demon-Haunted World,'' both collections of articles taken almost verbatum from his weekly Parade magazine articles. The tone is the same in both books as well. In DHW, Sagan urges an abandoment of pseudoscientific thinking, in ``Billions'' he urges that we consider the lessons of the past century and we must undertake forward-thinking views. The opinions are strong, but forwarded in an entertaining and non-threatening way. In this book, Sagan tackles a wider range of subjects than DHW. The first section talks about the magic of quantification, understanding light's wave/particle duality, and plots the direction of science in the future. The second section is sure to be controversial, as Carl examines current environmental problems and what we can do about them. He tries not to scare, while stating the facts bluntly. This is a refreshing pace from many other books on environmental issues in that it tries to convey a sense of hope and optimism. The final section seems to be a miscellaneous collection of chapters, covering politics, abortion, a recap of the most meaningful accomplishments of the twentieth century, and finally, Carl's own ruminations on his brushes with death. The main problem with B&B is that the chapters are pulled from Parade magazine articles, which means that the book doesn't seem to be a coherent whole. It feels like a collection of chapters and doesn't hold together that well thematically. Also, repetition is rampant, and by the end we can almost guess what Carl is about to say before we read it. However, it is a good read. Carl is a wonderful author and one of the few with the talent to entertain and teach at the same time. It is a good antedote to the end of the millenium pessimsm of books like ``The End of Science.'' The lesson Carl tries to teach us is that with war, hunger, pollution, and ignorance we still have long strides to go, difficult decisions to make, new discoveries to acheive. And he expresses it through the eyes of a child, wonderous and enthralled. I'm a big fan of Carl Sagan. I loved the 'Cosmos' series, I thought 'The Demon Haunted World' was an outstanding treatise on really important subject, and I really dug the movie 'Contact'. I have only respect for his views the role and value of science and rational thought in everyone's daily life. So I looked forward to 'Billions and Billions', his last work before his sad death a couple of years ago. Well, while much of the book is true to form, in parts I was a little disappointed. For the first time, and maybe exactly because of his own dreadful circumstances, Sagan allows himself to stray from his stock material, - matters scientific and logical, where he's pretty unarguably right - to matters where, to my mind, he isn't - matters moral and political. So his chapters on the crises facing the world, all of which start out nicely enough, start introducing solutions which have a cloying, left wing, aroma to them. To my reading of it, Sagan's basic thesis is that we (the proles) can't sort out the world's problems by ourselves, so we need a panel of wise men to legislate them away for us. That's a pile of old rope. Frankly, I have yards more confidence in the judgment (collectively) of the "man on the Clapham omnibus" than of any politicians (and I don't think the latter in any meaningful way represents the former), so I don't buy Sagan's argument at all. But what bugs me is the unspoken intellectual imperialism of it. "Not only are there Wise Men who must make critical decisions for you", implies Sagan, "but they are people like Me." Well, sorry, but as anyone who has done a Bachelor's degree will know, the only people worse equipped than politicians to make judgments on behalf of the rest of us are people who spend their lives hanging out at places like Cornell University. As a result Sagan starts sounding less like the completely dispassionate scientist and more like your common or garden sci-fi writer - his conceptions of how useful an idea government is aren't far off the loopy ones Arthur C Clark used to trundle out in his potboilers: you know, where, in five hundred years, finally the human race will Get It Right and we'll all live happily ever after. Call me cynical, but it don't work like that. Given the history of science, a scientist of Sagan's calibre ought to know that. This is the first book by Sagan that I've read. Simply said, it's written brilliantly ! I was amazed when I read the chapter on abortion. Sagan leads you to start thinking about issues in a different plane altogether. His systematic, analytical & scientific approach to solving problems would help anyone with a little logical bent of mind. The chapter on '20th century' seemed to cover environmental issues (again !) though Sagan had dealt with those exhaustively in earlier chapters. All in all, definitely worth reading. Pity that we don't have him around to share his views on what is going on in today's world ! Modesty was a bit difficult for Sagan. The first we learn of the author is that he was a celebrity. Witness the Tonight Show appearances and the Parade Magazine articles (and Sagan makes sure we do). There surfaces a certain immodesty of words as well. Words such as 'geosynchronous' are procured and proliferated (and anthropocentrically so, I might add). In some ways the book is better than I anticipated and is pellucid and even [modestly] eloquent in the consideration of ozone-depleting ("greenhouse") gases and the cost of environmental irresponsibility. As I have chided Sagan for his immodesty, I must also note that he is humble indeed compared to the swaggering, blustering, anti-environmentalist loudmouths with which we are too familiar. Says Sagan: "It's hard to understand how 'conservatives' could oppose safeguarding the environment that all of us -- including conservatives and their children -- depend on for our very lives. What exactly is it conservatives are conserving?" Had the scope of the book been more modest, i.e., had it stayed closer to environmental issues, it would have been better. But the author intended this volume to be something of a 'summa saganii' (Saganites will love it). Sheer poetry, of sorts, wins the day in statements like this: "We used [intelligence and tool-making] to compensate for the paucity of natural gifts -- speed, flight, venom, burrowing, and the rest -- freely distributed to other animals ... and cruelly denied to us." Of course, we don't fly for the same wonderful physical reasons that tree sloths and wallabys don't, and it is hardly "cruel" that humans can't inject their opponents with venom. Had humans venom and speed instead of intelligence and tool-making, Sagan's musings could not happen. I myself am happy to possess intelligence and forgo venom. Of course Sagan is too, he just can't resist waxing poetical. After the consideration of environmental issues, the text degenerates. The discussion of "Pro-Choice" versus "Pro-Life" starts as if it is leading somewhere but ends in a kind of 'hey, we just do the best we can.' The discussion of "ethics" versus "pragmatism" steps into the void. While it is admitted that subjecting ethics to Game Theory may be dubious (even scientifically), Sagan thinks it's fun and perhaps profitable. This is the domain of men without chests. The author finally makes a case for disarmament and peace; a case for science as a kind of candle in the dark (which includes a bit of scientism bearing the label of science); and a brief discussion of the conflicts and comforts involved in his approaching death. In summary: the book contains some strengths, some flaws, some errors, some tedium. Not recommended. 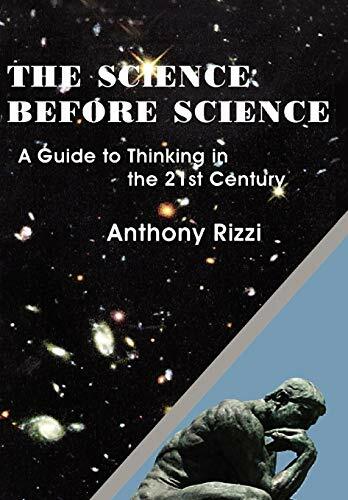 Dr. Anthony Rizzi's book "The Science before Science: A Guide to Thinking in the 21st Century" is a refreshing analysis of the problems of modern natural science. And it includes a solution! Dr. Rizzi gets to the bottom of one of the major issues that we have all come across in our encounters with statements from modern scientists in the press: bewildering propositions that cause us to question our ability to reason or to throw up our hands in contempt for science. For example, in a recent article, it was posited that one possible "explanation" of some aspects of modern physics is that there are copies of ourselves in an infinite number of other universes. What are we to make of this bizarre statement? We either conclude that we are completely unable to trust our reason which says "that is ridicules," or we lose confidence in science.Dr. Rizzi comes to the rescue by pointing out that we are not crazy, and modern science is internally reliable; it's just that the modern scientist has not properly translated his/her work from highly constrained theoretical conceptions to day-to-day reality. Rizzi says "they are not grounding their thinking in the basic understandings we get from a deep analysis of common experience (which Rizzi artfully does in his book) and which were so well established in classical philosophy." The solution is to reconnect philosophy with natural science. This reconnection is difficult but it is imperative in order to understand the relationship of modern scientific findings to the real world. Dr. Rizzi has both written the book and established an institute for just such an application:The Institute for Advanced Physics. The book is a "must read" for all natural scientists as well as the educated public.I recommend it highly. Anthony Rizzi earned two degrees in physics, one from MIT and the other from Princeton University. Among his accomplishments is included the resolution of an 80-year-old problem in Einstein's theory; the first scientist to be appointed to Caltech's Laser Interferometer Gravity Wave Observatory (LIGO, LA), and founding The Institute for Advanced Physics where he also serves as the full-time director. In The Science Before Science: A Guide To Thinking In The 21st Century (which is also available in a hardcover edition (1418465038, $28.95), Rizzi maintains that there "good science" is that which expands the human mind; "bad science" is that which confuses the human mind. He also points out that "good religion" confirms our nature while "bad religion" confounds our nature. What is needed is a combination of good science and good religion if we are to achieve a true and expanding understanding of the universe we live in. Along the way, Rizzi addresses such unusual issues as the possibility of time travel; how a fuller science naturally leads to proofs for the existence of God; artificial intelligence, other forms of intelligence in the universe, and more. As much a treatise on the philosophy of science as it is a compilation of the nature of sound inquiry whether it be in the fields of physics or metaphysics, The Science Before Science is engaging, informed, and informative reading for all students of science, philosophy, and religion. Dr. Rizzi's book is beautifully written and of profound importance for our culture.Currently, we are mired in a crisis of truth. People generally reject the notion of objective moral truth, in favor of a nihilistic relativism.Scientists, in principle, but not in practice, also tend to reject the certainty of truth in their own specific fields.No one seems to be sure of what they know, and many doubt that a person can know anything absolutely.This is the consequence, Rizzi says, of poor philosophical formation at the most basic levels of common sense. Dr. Rizzi is not only a brilliant phyisicist, but also an outstanding philosopher.His book gives us the philosophical tools which help us answer these questions, tools which help us to see clearly that we can know truth, objectively.He dispells the myth relativism as it appears in all fields of science, from morality and ethics to physics. 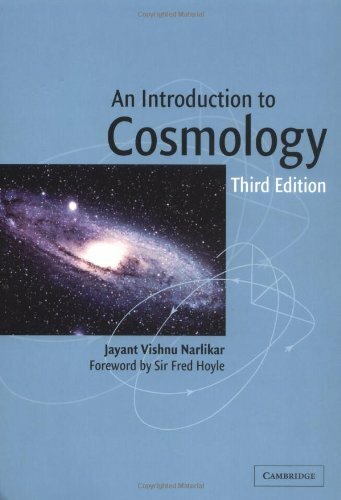 Jayant Narlikar's 'Introduction to Cosmology' has a simple enough title, but do not be deceived. This is a graduate-level textbook on one of the most difficult subjects around--mathematical, theoretical explorations of large-scale universal structures. If, as Stephen Hawking once said, for every equation in the book, you lose half your readership, I would calculate (just off the top of my head) that only a dozen people have read this book! Actually, to be serious, this book presupposes a knowledge of calculus (differential equations, vector analysis, Fourier series, etc.) and assumes a fairly extensive knowledge of physics (thermodynamics, electromagnetic theory, atomic structure, fluid dynamics). This is intended as a text book for the advanced undergraduate or graduate level student, and to that end, it has problems, most of which are computational in nature. Narlikar introduces general relativistic theory as a tool rather than a subject, for use in understanding the geometrical principles applied to cosmology. He continues forward to use standard models (Friedmann) of cosmology as solutions to Einstein's equations, before progressing to discussing the physical properties of cosmology, including galactic evolution (structure, kinematics and dynamics--one could refer here then to Milhaus and Binney's work on the same), particle physics and early universe issues. From here, Narlikar progresses to some non-standard cosmological constructions, including anisotropic cosmologies, steady state theories and cosmologies that might correspond to the Mach principle (although, as the name non-standard would indicate, these are fringe, or sometimes, older theories, which are largely discredited, but science must look to them as they occasionally give insight into observations). This, as an introduction, is not exhaustive, and does not get into cosmological models such as Alfven & Klein's matter-antimatter symmetry, the Einstein-Cartan cosmologies, or Milne's kinematic relativity, or the ideas of Segal or McCrea. From here Narlikar ends the book with discussion of observational cosmology, exploring the implications of local observations (such as background microwave radiation that permeates the universe, a discovery of Penzias and Wilson at Bell Telephone Laboratories), the Hubble Constant and redshift issues, and quasars (do they or do they not fit standard models of cosmology and scientific principles currently known?). In conclusion, Narlikar gives an brief summary of the cases for and against standard cosmological models, and a glimpse into future research, which will be aided as observational tools become more sensitive. In this book Sheldrake proposes that nature and its evolution has purpose and meaning beyond mere random mutations, natural selection, and survival. He contemplates on a deep sense of consciousness beyond what we are familiar with in traditional science, a type of consciousness that exists in all matter. I believe the author is onto something very interesting and worth exploring in the future. Toru Sato in his revolutionary book, "The Ever-Transcending Spirit" discusses this possibility from a very different perspective as well. This is perhaps the future direction of science. These books are well worth a read if you are interested in cutting edge theories on consciousness. 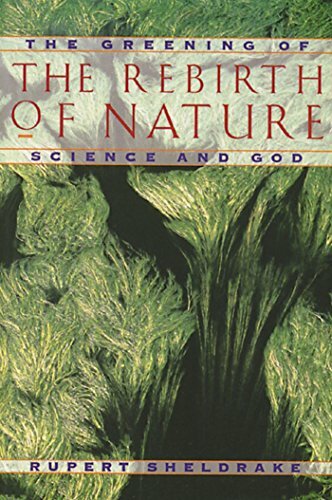 In his book, The Rebirth of Nature: The Greening of Science and God, Rupert Sheldrake proposes some ideas about nature, the planet earth and the universe which at first look, sound interesting, but upon closer examination may seem somewhat far fetched. Many of his ideas are rooted in spiritual concepts, yet he also discusses science, its characteristics and its history. Sheldrake attempts to link scientific concepts to his ideas, while at the same time showing disdain for the scientific way of thinking, which he terms "close minded." His ideas of "morphic fields" and "formative causation" are presented without convincing evidence. At best he offers anecdotes to support his claims, which include: the idea that animals can communicate telepathically across time and space, and that crystals influence each other through "morphic resonance." Reasonable people who have some knowledge of science will likely see there are less magical explanations for the phenomenon he discusses. At the same time Sheldrake scolds the reader as "mystery intolerant" if unwilling to accept the author's assertions. Sheldrake has purposely tried to blend science, which works through well thought out experiments to lead to the development of theories, and mysticism, which allows for leaps of faith to reach beliefs. Some may find this combination refreshing, while others might view the juxtaposition of these two methods of understanding, as intrinsically incompatible. Sheldrake's end goal seems to be to convince the reader of the great value of planet earth, and the importance of living in harmony with our environment. Indeed, this concept is crucial to the future of humanity and all life. Yet many will not need Sheldrake's extraordinary theories to lead to the recognition of this great truth. I read the first edition of Tom Van Flandern's book and it's excellent--a well written and absorbing work! While you may not agree with everything the author proposes (at least for now), you'll realize just how much intensive research and mathematical wizardy went into the author's exploration of current cosmology! Van Flandern is probably 100 years ahead of his time in the field of astronomy, especially in the re-examination of ideas like planetary breakups, the birth of the Earth-Moon system, and the origin of tektites. The author is a neo Kepler for the New Millennium, notably when it comes to rethinking science's blind faith in our present paradigm of the universe and solar system. (Especially fascinating is Van Flandern's discussion about the origins of asteroids and comets. How is it the majority of scientists have come to accept a concept like that of the so-called "Oort Cloud" based on little evidence?) If you don't mind having your scientific be! ! lief system rattled a bit, then get this book and read it! I have read this book twice already! For those of you interested in cosmology (the way the solar system and universe work) then this book is great. Tom Van Flandern cleary and succinctly puts forward his meta-model of the universe in a way that puts mainstream astronomy to shame. I have always believed that things can be logically explained and make sense in the cosmos around us. This book does just that. He makes a killer argument about an infinite universe in both time and scale, pointing out many reasons as to why the big-bang is a failure. Van Flandern discusses the speed of gravity by using the sun-earth-moon system to show that gravity must be travelling far quicker than the speed of light. I like how this book embraces many aspects of astronomy all in one. Best of all is his discussion regarding the basis of science, in that we should think of new models based on the existing evidence as opposed to fitting evidence to an old model. 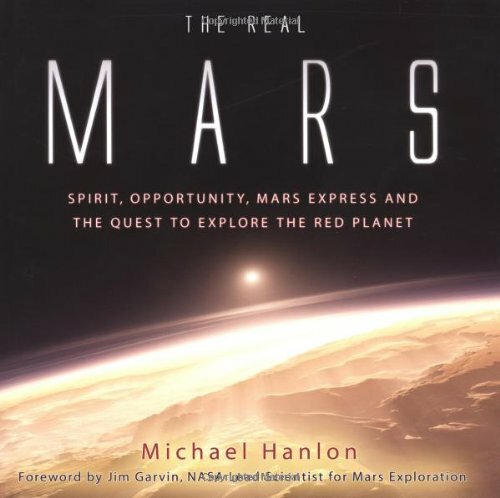 This book is a very worthwhile read and will open your eyes to what mainstream astronomy has been keeping from you. The best explanation of Very Long Period comets. If you want to know the very best explanation of the origin of the Very Long Period comets, this is where you will find it. If you combine the section on the Missing Planet, with a pile of album cover art by Roger Dean (on the YES album covers like Yessongs) you will know more about the history of the solar system then most professional astronomers. Is this hyperbole? No. Van Flandern is right about the origin of comets, but given the mindset of the astronomical community, protons will decay before they admit it. Van Flandern is akin to A.C. Clarke in one way: Someone once said about Clarke that "if he had stuck to any one hypothesis, he would have been a dangerous man." Like Clarke, Van Flandern works many hypotheses. And if it is permissible to have a favorite Clarke book or theme, it is certainly also permissible to extol the virtures of DM,MP&NC on the basis of the MP&NC material alone. Science will advance at four times the current pace when they stop ejecting people like Halton Arp and TVF from their ranks. Tom Van Flandern's book adds a new dimension to cosmology--not only does it present a novel approach to timeless issues, it stands up to the closest scientific scrutiny. The author has a proven track record and top notch credentials, so when he begins his hard-hitting critique of the status quo it's a breathtaking read, for laymen and scientists alike. Let's be honest about the Big Bang Theory--even the most respected scientists today will readily admit it is full of holes. But it takes a new look, like Tom Van Flandern's book, to explain not only why the theory is wrong but what to substitute in its place. This is a significant book and if you read it you will get a thrill just as those who read Copernicus and Galileo must have gotten a thrill to realize they were reading about the future of science. Read it--you won't be disappointed. Van Flandern was a consultant to the government regarding the Global Positioning System. Doubts had been expressed that the GPS could remain accurate due to a relativistic effect known as "frame dragging", but TVF concluded that, through a slightly too convenient coincidence, "frame dragging" didn't apply to this particular narrow case. It's clear that he understands conventional theories very well, and that's what made it possible for him to develop his Meta Model, the discussion of which comprises the first half of this book. I can see how the Meta Model discussion would not get high marks, as it clearly didn't in at least one of the earlier reviews here. I read most of it, finally got bored, and skipped into the second half of the book (first edition ISBN 1556431554) which pertains to TVF's Exploding Planet Hypothesis. When he wrote the first edition, the Alvarez theory was gaining momentum elsewhere in the sciences, as the position of the impact crater that ended the Cretaceous had been located at Chicxulub (the crater had been located circa 1960, but the Alvarez theory didn't come around until 1980 -- see "Night Comes to the Cretaceous" by James Lawrence Powell, ppback 0156007037 hardcover 0716731177). TVF didn't mention any of that, spending time instead on the "Face on Mars". At that time (early 1990s) the newest surface photos from Martian orbit were still those of Viking from the 1970s. The "Face" did exist, and it was an artifact -- but it existed only in those photos, and was only an artifact of the lower resolution of the Viking cameras, as opposed to that of the recent (late 1990s) orbiter. I don't see how any reasonable person can look at the higher res photos (as opposed to both the Viking photos and the low res photos from the new orbiter, which can mimic the resolution of Viking) and conclude that the "Face" is artificial. This devotion to a completely discredited idea is not to TVF's credit, and as someone who respects his intellect and many of his ideas, I wish he'd knock it off. The best part of either edition is the discussion of TVF's Exploding Planet Hypothesis (EPH). He uses the model to explain things like the tipped axis of Uranus, disturbed moon system of Neptune, retrograde rotation of Venus, Earth-crossing objects, and various other things which have made thoughtful people wonder for a very long time. In the original edition the EPH was about 3.2 million years ago. This new edition extends the EPH by adding an earlier exploding planet dated to 65 million years ago, in order to provide a source for the object which crashed into the Earth and ended the dominion of the dinosaurs. TVF's extension seems a bit ad hoc, but once a single unexplained planetary explosion has been posited, additional ones shouldn't be considered surprising or forbidden. On the other hand, TVF had already questioned the (also ad hoc) Oort Cloud idea, and that's the leading competitor (and dominant paradigm) for a source of the Chicxulub object. Since TVF is devoted to building a single comprehensive model to explain oddball characteristics of various solar system objects to replace the dozens of (also ad hoc) unique explanations. TVF's discussion of the origin of Earth's own Moon is a great reason to buy this book, and a great place to begin reading it for those who are like me, and enjoy picking at a book here and there. It's also a discussion I'd like to criticize a little. TVF discusses the four basic models of lunar formation, then picks them off one by one, as he offers his own model (fission from Earth due to overspin). The problem with his critique of the capture model is that his arguments apply also to his overspin model, and there's nothing he can do about it. Furthermore, the early presence of water on the Earth (a discovery that I think antedates this new edition of "Dark Matter") reduces the likelihood that the Moon was born of fission from Earth, either due to TVF's model or the more conventional impact model which is the dominant one of the five presented. Our universe was born billions of years ago in a hot, violent explosion of elementary particles and radiation--the big bang.What do we know about this ultimate moment of creation, and how do we know it? This may not be one of the easiest books to read, but it is definetely one of the most informative and up-to-date on the subject. The theories of universe creation, galaxy and star formations, etc., as well as the supporting evidence are presented in full. Speculations on the future, as well as alternative theories to the big bang are briefly covered as well. The book's difficulty and the fact that it resembles a textbook is the only reason why I downgraded my recommendation from 5 stars. Silk wastes no time and space, and pummels you with facts and theories from the onset, with little in between. The textbook feeling is also conveyed through the author's completely objective tone throughout. This may even seem frustrating to some, especially in the early chapters when Silk presents dozens of competing theories and observations, without even a hint as to which is more likely or which he himself supports. Nevertheless, he does proceed to elaborate on all the major theories and specifies which currently carry the most support in the scientific community and why. Overall, I highly recommend the book, especially to those who are not new to at least the basic ideas of cosmology. Others will need to be a bit patient as the reading is quite dense -- Silk packs about a 1000 pages of info into 400 pages of text; inevitably you may need to re-read certain parts at times in order to follow the logical flow and development of presented theories. I found the observational data to be too technical sometimes as well, and just took the author's word that it supports the theory forementioned. I truly believe that this is the only book you need to read. It has all the concepts, theories about the story. Densly written and every sentence has concept, theory in it. Starts with the history of cosmology and continues with Cosmological Models, Origin of Galaxies, theory of Galaxy formations and star formations and future of the Universe. Inflation and other theories are all covered to the extend that space allows. What I liked most in this book is that it covers everything and you do not need to read ten books to get the idea complete. For more technical oriented person, book has Mathematical section at the end describing the concepts with formulas. 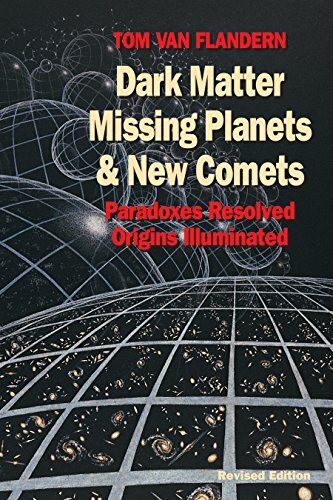 Author always gives brief description of concepts and usually he explains any conclusion with reasons so that if you can not derive the conclusion by yourself there is the reason.This book together with Kip Throne's beautiful book on Black Holes will make it complete. The Big Bang, 3rd Edition Reviewed by: Chris McKinstry, VLT Operator. This book is about the best introduction to the Universe that one could hope for. I think of it as a giant and highly detailed Scientific American article (including the illistrations and colour photographs.) This updated classic (2nd edition is 11 years old,) is both current and complete (it contains the most recent findings dervied from Hubble and VLT observations.) It even has a VLT picture I helped take of M104 that was released to the public just last month. Is Darwinian evolution established fact, or a dogma ready to be overtaken by the next scientific revolution?The intelligent design movement argues the latter. 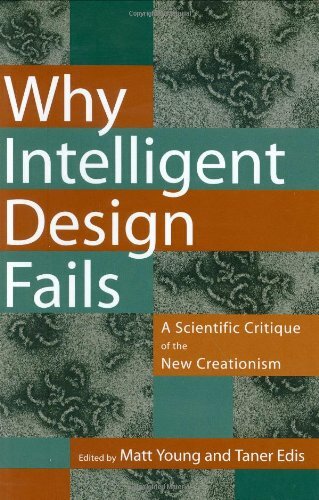 Why Intelligent Design Fails assembles a team of physicists, biologists, computer scientists, mathematicians, and archaeologists to examine intelligent design from a scientific perspective.They consistently find grandiose claims without merit. Contributors take intelligent designs two most famous claimsirreducible complexity and information-based argumentsand show that neither challenges Darwinian evolution. They also discuss thermodynamics and self-organization; the ways human design is actually identified in fields such as forensic archaeology; how research in machine intelligence indicates that intelligence itself is the product of chance and necessity; and cosmological fine-tuning arguments. The idea behind this magnificent book is to pair stunning images from outer space alongside meaningful spiritual quotes from here on earth. Ultimately, the two work well together, suggesting the presence of a divine hand, or at least a divine order in the universe. Editor Michael Reagan deserves much praise for his keen visual eye, as well as his selection of quotes from the likes of Albert Einstein, Jane Goodall, Stephen Hawking, Dr. Seuss, Theodore Roethke, Carl Sagan, Mark Twain, and Annie Dillard. Many of the photos were taken from the Hubble Space Telescope, offering fascinating glimpses into distant black holes and galaxies. Some images are vivid and romantic like a Renaissance painting. Some (such as the Voyager I photo of Jupiter) seem to suggest that Vincent van Gogh had a hand in painting the universe. Each photo has a concrete caption and clearly explains what is happening and where the image comes from. I am enchanted with this book, one of the most exquisite books I have seen in a long time. The photos are beautiful and thought provoking. The carefully chosen texts reflect not only the scientist's natural bias toward the provable, but also the respectful awe of the scientist who cannot totally explain the observable phenomena. It is a book I want to share with many. Prof. Smolin is a brilliant teacher. His first book 'The Life of the Cosmos' contained already the simplest and brightest explanations of the basic elements, processes and principles of modern physics. Here he does it again with the latest progress in the search for a theory of quantum gravity: loop quantum gravity, string theory and black hole thermodynamics. He dissects the strenghts and weaknesses of the different approaches and shows how they culminate into the holographic principle, where one set of events receives information about other parts of the world. Lee Smolin explains in a very comprehensible vocabulary that space and time are not continuous, but discrete; that the world is made of processes, not things; and that the world is nothing more than an evolving network of relationships, of which causality is the most important. These characteristics have important philosophical implications; e.g. they refute the belief that observer dependence rules out objectivity. This book contains some mind-boggling propositions. One from Lee Smolin himself, where he admits that he doesn't belief in the uncertainty principle, although he continues to work with it. Another one is the use of the whole universe as an instrument. In the end, the author is very optimistic and predicts that a theory of quantum gravity will be found in the first decades of the 21st century. This book is a fascinating tale about the real nature of the universe. A must read. What's our universe made of? I am very impressed with this book. This is going to be one of the seminal science book for lay persons, right up there with Stephen Hawking's "A Brief History of Time". Lee Smolin is an active researcher in Loop Quantum Gravity. He laid out in a clear manner the research progress of Quantum Gravity. Quantum Gravity, once completed, should able to reveal the basic fabric of our universe, and say a lot about what is the stuff that space and time are made of. There are no mind boggling math in the book, but there are lots of mind boggling ideas that once Smolin explains them, I am left with a sense indeed this must be how our universe works. Smolin thinks understanding how Black Hole works is key to progress in Quantum Gravity. He gives a modern update of what we know about Black Holes, siting a few fresh research results. This is very valuable, because the typical Black Hole books for the lay person are very dated indeed. A modern treatment is exactly what we need. 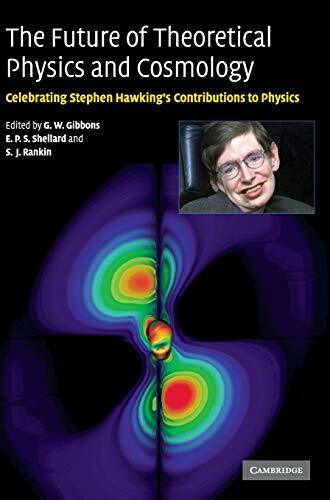 This book is a must for the fans following the going-ons in the newsgroup sci.physics.research. Since the postulation of theory of relativity (theory of cosmos, which describes the structure of space and time), and quantum mechanics (laws of microcosm, which describes atomic structure, nuclear forces, and nature of basic component of matter); physicists until now have struggled to explain gravity (which is a manifestation of spacetime fabric in presence of matter) in terms of quantum mechanics (quantum gravity). 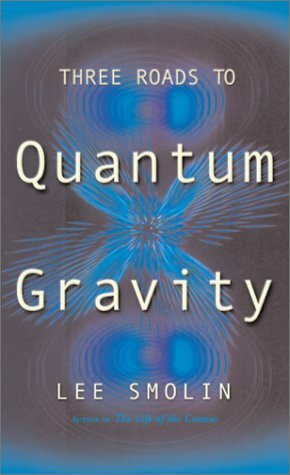 In this book the author attempts to explain three different approaches to quantum gravity; Loop Quantum Gravity (LQG), Superstring - M theory (S. -M), and Blackhole Thermodynamics (BT). While each takes a different starting point, they all agree when viewed on Planck scale, and they also view space and time are not continuous, and space is composed of discrete units. LQG gives us a detailed picture of these units in terms of spin networks, where as S.-M theory proposes continuous space in terms of a continuous string (with compactified extra dimensions) made of string bits, which is governed by uncertainty principle. BT theory states that amount information in any given space is finite and is proportional to the area of the boundary of the region in Planck units. The author is a pioneer in the field of LQG and provides the reader with a good introduction of the theory in a non-mathematical form and then compares with S.-M and BT theories. The book is described in three parts; the first part is a general introduction, which describes historical development of three theories, the second part introduces LQG and then compares with S.-M and BT theories, and the final part attempts to unify the three approaches into a single theory using Holographic Principle. The author gives us several interesting accounts of physicists working in these fields are in a climate of mutual ignorance and complacency with the belief that their theory is correct and others are wrong. There are instances when one group can't solve certain problems, and they seek the help from the other camp. The author also briefly explains other theories such as Twister theory, and Non-Commutative Geometry. This is one of the few books I have read which describes LQG in some detail, although there are several books in literature, which describes S.-M theory. The author is very honest in comparing the three approaches to offer the best explanation for quantum gravity. Anyone who wants to understand LQG must have this book. I have a pretty good background in math and physics. But I learned almost nothing here. I think someone with less background would learn even less. The problem is he never really defines anything, never makes clear whether he means a 'loop' is a real thing or just a calculation tool, etc. It is all just so mushy. Plus he talks a lot about theories that have no experimental tests, and none presently envisioned. This seems like metaphysics to me. You want a real popular science book that explains real science to a layman? Read QED by Feynman. Read Relativity Visualized by Epstein. Sorry about the review title, just musing on the phrase "Divide and Conquer". As every reader probably knows, general relativity and quantum theory are both extremely successful, predictive theories, but have yet to be brought together in a single, complete framework that seems to clearly apply to our universe. Smolin did an excellent job in this book, already several years old, of discussing approaches to the problem, with emphasis on Loop Quantum Gravity. As usual while reading it I wished that I could plumb the depths of the underlying math, which of course the author did not attempt to present. Leading cosmologist Martin Rees here provides an overview of present thinking about the origin and nature of the universe, using six key numbers (the ratio of electromagnetic force to gravitational force, the strength of nuclear binding, the density of the universe, the cosmological constant, the variations in density of the universe, and the number of spatial dimensions). Based on the title, I expected the book to focus tightly on these numbers; however, Rees rather tends to use them as a jumping-off point to address broader issues, which I think is all to the good. For example, he uses N (imagine a fancy script version), the relative strength of the electromagnetic and gravitational forces, as a starting point for discussing how gravity molds the universe despite its relative weakness. He's a believer in the weak anthropic principle, meaning that he thinks that our universe is uniquely suited to letting life come into existence. His corollary is that there are very many universes, each with its own physical laws, but only a few tuned well enough to support life. Like all grand theories of cosmology, it is a breathtaking concept. Recommended for any intelligent layman wanting to learn more about current thinking about the universe. Challenging, informative reading for science buffs. 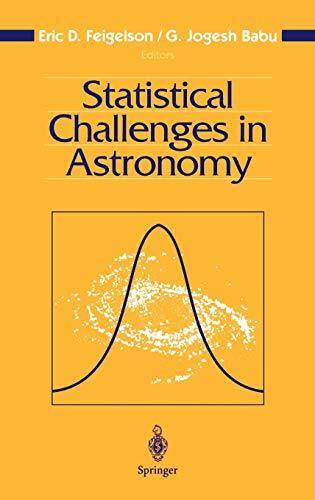 The author of this book, Sir Martin Rees, is the Royal Society Research Professor at Cambridge University and holds the title of Astronomer Royal. One must assume, then, that the arguments that he puts forward in this book represent the very best thinking of what is to me a very esoteric science. He apologies for the slow gestation of this book, written especially for the Science Masters series. But in my mind he need not apologise as has completed a formidable assignment - that of explaining in everyday terms some of the leading-edge theories in the realm of cosmology. In this book Sir Martin shows how just six numbers, imprinted in the 'big bang', determine the essential features of the physical cosmos. He also shows that cosmic evolution is highly sensitive to the values of these numbers and that if any one of them were 'untuned' there could be no stars and no life. Or at least not in the way that we know them today. So what are these six fundamental numbers? The first is a ratio of the strength of the electrical forces that hold atoms together divided by the force of gravity between them. It is very large, about 1036, and were it a few zeros shorter, only a short-lived miniature universe could exist and there would be no time for biological evolution. The second number is also a ratio and is the proportion of energy that is released when hydrogen fuses into helium. This number is 0.007, and if it were 0.006 or 0.008 we could not exist. The third number, also a ratio, relates the actual density of matter in the universe to a 'critical' density. At first sight this number appears to be about 0.4. If this ratio were too high the universe would have collapsed long ago: if too low, galaxies or stars would not have formed. The fourth number, only recently discovered, is a cosmic 'antigravity' and appears to control the expansion of the universe even though it has no discernible effect on scales less than a billion light years. The fifth number is the ratio of the energy required to break apart a galaxy compared to its 'rest mass energy' and is about 10-5. If this ratio were smaller the universe would be inert and structureless: if much larger the universe would be so violent that no stars or sun systems could survive. The sixth number, surprisingly, is the number of spatial dimensions in our world (3). Life could not exist if this was 2 or 4. In this book Sir Martin discusses each of the above and develops reasons for the limits that he gives. He postulates that perhaps there are some connections between these numbers but states that at the moment we cannot predict any one of them from the values of the others. Perhaps a 'theory of everything' will eventually yield a formula that interrelates them. More thought provoking is Sir Martin's discussion of what or who 'tuned' these numbers. He identifies three scenarios. One is the hard-headed approach of 'we could not exist if these numbers weren't adjusted in this special way: we manifestly are here, so there's nothing to be surprised about'. Another is that the 'tuning' of these numbers is evidence of a beneficent Creator, who formed the universe with the specific intention of producing us. For those who do not accept the 'providence' or Creator arguments, and Sir Martin places himself in this category, there is another argument, though still conjectural. This is that the 'big bang' may not have been the only one. Separate universes may have cooled down differently, ending up governed by different laws and defined by different numbers. 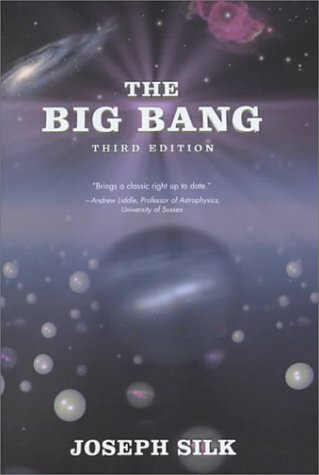 Certainly, reading this book (and its no light task in coming to grips with the scale or immensity of the numbers) has been rewarding for me and has awakened in me an interest in looking further into other discussions regarding the 'big bang', time and parallel universes. Is this "just the way things are?" This book is about cosmology, and specifically the manner in which our universe is constructed. The basic premise is that six dimensionless numbers govern the state of our universe so precisely that if any of them changed by even a tiny amount the result would be the impossibility of life, as we know it. Rees argues that if any of these numbers were slightly different from what they really are, the universe as we know it would not exist. For example, if the ratio of electrical force to gravitational force was larger (by just a "few zeros") the universe would exist for only a short time and there would be no time for the biological evolution that led to animals such as us. Similarly, if the fusion of hydrogen to helium released much more energy than it does, stars would burn out more quickly, again leading to a universe in which animals like us would not have time to evolve. Punctuated throughout the book are references (sometimes abbreviated) to the larger question of why these six numbers, and why the values they have. There's a natural sense of awe and amazement that these numbers all just happened to have precisely the values needed to make life, as we know it, possible. Such amazement leads, naturally enough, to various attempts to explain the apparent coincidence. Perhaps the first question is whether it's a coincidence at all. That is, perhaps the universe was "designed" by a "god" who picked the numbers, knowing before hand exactly what values were needed. Of course this explanation leaves us asking why there is a "god," which seems like as big (or bigger) question than why a half-dozen ratios have the values they do. So this line of reasoning doesn't seem to take us very far. Another approach is to invoke the anthropic principle (I think this is the one Rees prefers). In other words, we see the universe the way it is because if it were any other way we would not exist to wonder about it. Okay, so that doesn't really "explain" anything, either - or, at the very least, it seems just a little too convenient. After all, couldn't we invoke the anthropic principle for just about anything? And if we did, what would happen to our sense of wonder and our desire to learn more - to push back the string of "why?" questions at least one more level? On the other hand, suppose the apparent coincidence is just that; apparent? Suppose these numbers are all somehow related. Suppose that if any one of them is in the right range, all the others will be in the right range, too. That might be the case, but as Rees explains, "At the moment ... we cannot predict any one of them from the values of the others." Although we don't know for sure, it's possible that physics will eventually uncover the "theory of everything" and the ratios will all be in there, in a very nateral and logical way. Or, perhaps the answer is simply "because that's the way things are." Anyone who's been around children (or been a child themselves) knows about the "why?" game. It starts out with something like this: "Daddy (or Mommy), why is the sky blue?" So you explain about Rayleigh scattering and the fact that molecules in the atmosphere scatter photons with an efficiency that's inversely proportional to the fourth power of the wavelength. You are hardly finished when the next question shoots across your bow: Daddy (or Mommy) why is there an atmosphere?" So you dutifully explain planetary evolution, the expulsion of vast quantities of carbon dioxide that facilitated the evolution of life forms that exploit photosynthesis, producing oxygen, etc. Then the third question comes "Daddy (or Mommy) why do planets form?" You follow this question with a short lecture on the planetary nebular hypothesis. But the questions don't stop; they just keep coming and coming and coming. There is, it seems, never an answer that cannot be followed with "why?" If we did have a "theory of everything," and if it did explain these six ratios, there would still be the question "why this theory of everything?" And if we answer that, there undoubtedly will be another "why" question after it. Is there ever an answer that cannot be followed with "why?" That's the real question, for me, in Rees' book. Would the string of questions stop if we could answer why there are just "six numbers," and why they have the values they have? Or, could it be that we might answer that question simply to discover a new "why" question? And if not, how would we know if or when we've arrived at the final answer: "Because that's just the way things are?" This book covers a lot of ground, and does so in abbreviated style in many instances. It's something of a quick cosmic tour. I liked it best for the way it helped me think a little more deeply about the bigger picture. It's a fun book to read, and definitely well worth the time. JUST a little book that explains A BIG TOPIC!! (3) Speculative cosmology (which is based on hypotheses). These are large topics that can be incredibly complex and detailed but Rees manages to explain these topics in only 160 pages! As well, the language involved in explaining these topics can be very technical but Rees manages to reduce the technicality resulting in a book that's easy to follow and thus that's "intended for general readers." I agree that this deceptively concise book is written for the general reader. However, for those not used to this kind of material, I suggest reading this book slowly since Rees cuts out extraneous detail. 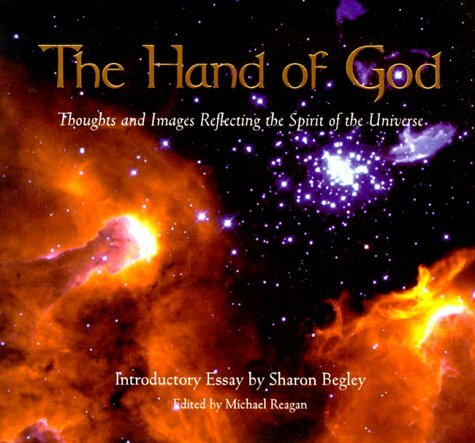 Whether you are used to this kind of material or not, you'll find that this book offers a stimulating and accessible account of new discoveries, and perceptive insights into cosmology. In fact, this book is so well-written, that according to Rees' internet site, this book is being considered for translation into twenty languages! Rees, in the last paragraph of this book, summarizes its contents: "A theme of this book has been the intimate links between the microworld and the cosmos...Our everyday world...[shaped] by subatomic forces...owes its existence to our universe's well-tuned expansion rate, the processes of galaxy formation, the forging of carbon and oxygen in ancient stars, and so forth. A few basic physical laws set the 'rules'; our [universe's] emergence from a simple Big Bang was sensitive to six 'cosmic numbers.' Had [any one of] these numbers not been 'well-tuned' [or precise enough], the gradual unfolding of layer upon layer of [the universe's] complexity would have been [suppressed]." That is, "there would have been no stars and no life." 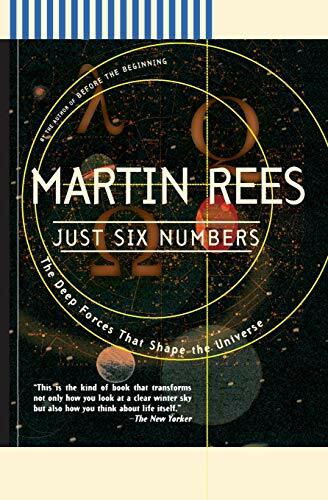 This book has a framework that is centered around the above six cosmic numbers or as Rees states: "[T]his book is the story of six [numbers] that are crucial for our universe, and our [that is, biological life's] place in it." What are these six numbers? Three of them relate to forces in the universe (two of these numbers are basic forces while one of them deals with an "unsuspected new force"); one number is concerned with the basic "texture" of the universe; and two deal with the properties of space itself. As already mentioned, all these numbers have a precise value that allow our universe (and us) to exist. Rees asks: "Is this [precision] just...a coincedence? Or is it providence of a benign Creator?" Besides learning about these six critical numbers, the reader will learn much more. Some other things you'll learn about are antimatter, atomic structure, atoms, neutrinos, quarks, the periodoc table, the importance of hydrogen, deuterium, and helium, biological evolution, dark matter, black holes, cosmic background radiation, protoplanets and planets, galactic clusters, the strong nuclear force, extraterrestrial intelligence, particle physics, quantum theory, relativity theory, supernovae, and superstring theory. You'll read about such people as Einstein, Arthur Eddington, Michael Faraday, Richard Feynman, Galileo, Newton, Stephen Hawking, Fred Hoyle, and Edwin Hubble. 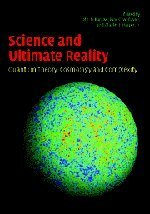 At the end of the book, Rees asks more questions: "Are there an infinity of other universes [called collectively the 'multiverse'] that are "badly tuned," and therefore sterile? Is our universe an "oasis" in a mutiverse? Should we seek out other reasons for the...values of our six [cosmic] numbers?" My only minor complaint (and I'm nit-picking here) is that in chapter one Rees states the value of one of these six cosmic numbers. (It is a one followed by 36 zeros.) Instead of expressing this number in scientific notation, he actually writes out all the zeros. I reasoned that by doing this he was attempting to convey a sense of the immensity of this number. However, in chapter three he does the same thing. Why? Writing this long number out once was quite sufficient. In conclusion, this book offers an accessible account of the forces that shape -- everything. You'll find this book to be an enjoyable and provocative intellectual adventure! Starlight Nights: The Adventures of a Stargazer by Leslie Peltier is a wonderful book, which embodies the heart and soul of stargazing.It was out of print for many years, but has been republished by Sky Publishing, and is available through Amazon and through the Sky & Telescope Store online.I obtained a copy last year and read it.Once started, I couldn't put it down. Peltier begins when, as a child of five, he first saw the Pleiades.As a young teenager he saved up his money and bought his first scope, made his own observing pier in the pasture, and hung out every night learning the night sky.The book covers about 60 years in Peltier's life, including his stargazing honeymoon out west.He observed every night he could, undeterred by cows in the field or snow on the ground. He became an avid variable-star observer and a comet hunter. He tells the story of bicycling into town on a dark November night in 1925 to telegraph his first comet discovery to Harvard College Observatory.One of his early telescopes, a six-inch refractor, had a wooden (mahogany) tube. When he found each comet he neatly carved the date in the tube of the telescope. Over the years he built his own observatories, and obtained castoff FAMOUS telescopes (a twelve-inch refractor made by Alvan Clark), when Miami University of Ohio, 125 miles from his home, wanted to upgrade theirs. He became famous among astronomers, but always lived a simple life, shunning publicity, and not straying far from the family homestead in Delphos, Ohio.Leslie Peltier was a gentle soul, self-effacing and honest, and "real".He writes as if he were talking to a friend, telling a favorite story. This book captures the romance of amateur astronomy.Peltier embodied the "heart and soul" of a stargazer.As David Levy says in his foreword, this book explains the "why" of astronomy, and not just the "how". It's a book every stargazer should read. A message from another world. This is a jem.The author would likely fail to recognize the world of 2002, and would certainly be horrified to awake in it. He lived, really lived, in an earlier era when discovery of a new comet by an amateur simply looking through a telescope, without the CCDs and other fancy technology,was celebrated, and civilization grew at a pleasant pace in the midwest where he lived, away from the hustle, rush hours, and UN crisis.His humility in accepting the gifts of slowly increasing aperture telescopes and the way in which alone, he found good ways to use them to their best are balm to the soul. Get a copy of this little book, turn off the TV and computer and regress to Peltier's world of worthwhile ways of spending your time while seeing the universe.Fortunately, you don't really have to wait weeks to get a copy if you'll dial up Sky and Telescope. Remember those movies where an old man tells his story in the form of a flashback?The kind that makes you wish you could go back in time to hang out with them, experience their life? Starlight Nights is one of those stories. Leslie Peltier's book is full of warmth and humor.He takes us back to a 1905 farm and describes what it was like to grow up without electricity, television.The beginning of his story predates the spread of the automobile.We watch as he buys a small telescope, and without the benefit of a college education, becomes the friend and colleague of the eminent astronomers of his day.We experience the thrill of finding comets and novae, and at the same time, the quiet joy of country life a century ago. The book is wonderfully illustrated by Mr. Peltier himself, and the introduction includes family photographs. Absolutely recommended for everyone, not just stargazers. "A hymn to the sky" -Levy. 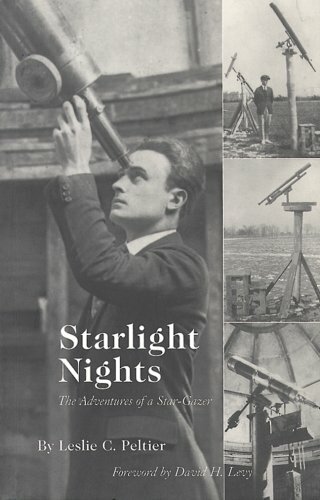 To me, no book more beautifully captures the spirit of amateur astronomy that Peltier's Starlight Nights. I first read this book several years ago and still remember marveling atPeltier's intensely personal autobiography. In writing of his childhood inDelphos, Ohio, he spares few details of life on the early 1900's farm, andwe wait spellbound with him as he orders his first telescope after catchingthe astronomy bug as a young teenager. We breathlessly await the partialeclipse of 1918 (the teenaged Leslie lacked the funds to travel the 500miles necessary to see totality in the US's first total eclipse of thecentury), and are swept away again that very night as he was one of thefirst to note the spectacular Nova Aquila as it rose to a stunning -1.4mag. Peltier's descriptions of his experiences are as elegant as they aresimple. His deep respect and admiration for nature are woven into everypage, not only for things astronomical, but terrestrial as well, for he wasa naturalist of varied interests. This reissue comes with a new forewordby David Levy, as well as several rare photographs (on the cover and back,as well as a few in the foreword) of Peltier, his early telescopes andhomes. If you are familiar with this book, take this opportunity to read itagain. If you've never read it before, set aside a long evening - you won'tput it down after you start. This is one of my all time favorite books.It is the autobiography of Leslie Peltier, a legendary amateur astronomer.It tells the story of him growing up in the midwest and his interest in nature.This eventually ledto him becoming an amateur astronomer, discovering several comets (whichbear his name), and performing variable star observing and recording forthe American Association of Variable Star Observers (AAVSO). His writingstyle shows his early 20th century, midwest upbringing and at times issimply poetic. I've read this book at least 4 times and each timebringsa calm and inspiration not common in todays world. In his latest far-reaching book, The Fifth Miracle, internationally acclaimed physicist and writer Paul Davies confronts one of science's great outstanding mysteries -- the origin of life. Three and a half billion years ago, Mars resembled Earth. It was warm and wet and could have supported primitive organisms. If life once existed on Mars, might it have originated there and traveled to Earth inside meteorites blasted into space by cosmic impacts? Davies builds on the latest scientific discoveries and theories to address the larger question: What, exactly, is life? Is it the inevitable by-product of physical laws, as many scientists maintain, or an almost miraculous accident? Are we alone in the universe, or will life emerge on all Earth-like planets? And if there is life elsewhere in the universe, is it preordained to evolve toward greater complexity and intelligence? Paul Davies is a good writer because he recognizes that the best science topics yield more than one answer. This book explores several likely explanations for the origin of life. What is particularly interesting about Davies's coverage is that he sees life primarly as an information processing phenomenon. For the paradox of life becomes that it must be based upon a random pattern of information, but that pattern is not so random as to be chaotic and meaningless. Life walks the tightrope over the abyss of total disorder and below the ceiling of completely predictable information. Neither is suitable for life. The reader doesn't find any absolute answers here. But for a thought-provoking discussion on the meaning of what constitutes a living thing, the book does an excellent job. Davies delivers a decent book reflecting the current state of biogenesis theory: basically more questions than answers. He does seem to stand steadfastly under the mantle of Darwinism yet at the sametime shake at its very foundations. He offers a rather good description of the two opposing world views and current battle: life as an isolated accident vs. biological determinism (life was inevitable). For more on a biological anthropic priniciple I would suggest "Nature's Destiny" by Michael Denton. 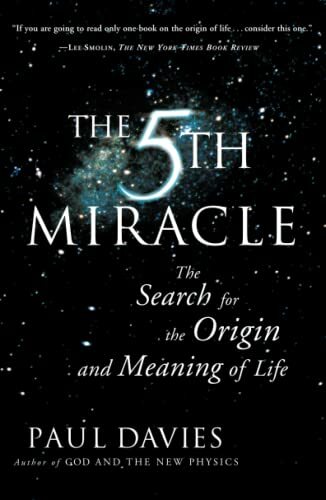 All in all I would say "The Fifth Miracle" is a very interesting read and overview; certainly more open & honest than other Darwinists about problems with Darwinian theory & Biogenesis. One side note I do have, was an unnecessary ideological statement made in the book saying, "You are, for example, host to a billion or so atoms that once belonged to Jesus Christ,.." (p.147) because atoms from dead organisms are recycled into the environment and us. The implication of course being that Jesus died and in fact decomposed, which Christians obviously don't believe to be the case. Davies is free to dispute that yet in the context he uses it merely for inflammatory purposes. The best little book I have read in years. The fifth miracle is an outstanding little book that discloses a miriad of possibilities about the origin of life on earth. The controversy arises when Davis exposes some unorthodox theories like Panspermia, the truth is that when he does that he is really persuasive. Paul Davies is an intelligent scientist and one that has kept updated and with experience on field, so his arguments are no less than powerful and convincing, once again, even the controversial ones. Though he doesn't take part in most of the different theories explained, his book might look a little biased, but great, besides he may even be right. fails to answer the big question. Davis titled his book the Search for the Origin and Meaning of Life, but he never really answers this fundamental question. Sure, science hasn't answered this, and unlike Davies' optimistic assertion that they will accomplish this feat someday, I don't believe science will. If approached from the viewpoint that life arose spontaneously from the haphazard collision of random molecules by the direction of chance then the mystery will never be solved. The process that produced life was so improbable that it can't be reproduced in the laboratory and was truly an event that took place against all odds. Understanding that anything with a value of 1 10^50 is an impossibility, and that the conditions for life to occur would need a much bigger number, attempting to solve this mystery is a waste of time. Nevertheless, if life is the product of a set of laws written into the universe that favor the creation of life then the search is not futile. Nevertheless, this opens up the possibility for design arguments and the need for a programmer to write such a code; This is a development that I welcome as a Christian, but one that is scorned by other scientists. Some of this attitude comes through at times in Davies book when he states on pg. 31, "However, it is the job of science to solve mysteries without recourse to divine intervention." This assertion is patently false. It is the job of science to explain observable phenomena with a natural explantion if the results are verifiable and make more sense than a mystical argument. It could very well be that the deity who created the universe was a very competent programmer who designed the creation to operate under very specific natural laws, and one of those laws is for the universe to create life under the right conditions. This is just a possibility, but one that should not be eliminated simply because the establishment thinks it should. In the end this book fails to answer the question that matters most: If life did arise by natural means, then how did it do so? Davies offers absolutely no new insight into this perplexing question. In fact, many of his arguments seem to point against random, senseless and purposless creation. Believing that all the right circumstances could fall into place is just as much grounded in faith as is the idea of a Divine creator. The only new arguments presented by this book were those that speculated that life began underground and not at the surface. Yet, this raises a whole host of questions. RNA or DNA could not develop inside the earth because the tremendous heat and pressure would destroy the volatile molecules. Therefore, one is forced to conclude the cell came first and this gave the RNA and DNA the sufficient shelter to form and replicate. But this just brings us back the chicken-egg paradox and doesn't answer anything since the cell cannot survive efficiently without the help of DNA, RNA, and catalytic enzymes. Stating that the first simple cell was a more crude device which operated on a more crude scale only begs the question and is meaningless conjecture without evidence. In this book, Dr. Pickover takes us on a scientific and historical tour of the development of our understanding of the workings of stars (of which our sun is the nearest example). In the usual Pickover manner, the author does not let us rest with a light-hearted thesis on nuclear physics. He leads us to the conclusion that neither stars nor our universe could be without the fortuitous existence of an excited state of the carbon-12 nucleus. Is this because the excited state of carbon-12 was designed so or has our universe evolved from a cosmology of universes in such a way that the excited state is a necessity? The reader is left to ponder the question. For more speculations about God see Dr. Pickover's next tome, "The Paradox of God and the Science of Omniscience", also available on this web site. The star of heaven is you. The stars of heaven - where would we be without them? Actually nowhere; we as humans would not exist without them. As carbon based lifeforms we owe our very existence to the stars since they are the source of this carbon, and what a close call it is that this carbon is formed at all. Were the number 7.6549 (the resonant energy state of carbon in MeV) just a few percent different, the stars would not produce this carbon, and the rich biochemistry that make us human would not be possible. So, if you ever wondered where you came from, Pickover has the answer in these glorious pages. A journey to the stars would be wonderful, but the journey of the stars to us is even more wonderful. Pickover tells the amazing story of where we came from for those who wonder at that amazing question. If there is ever a time more than any other that we need astronomy, it is now. Because astronomy -- from backyard stargazing on up -- reminds us there's much beyond terror looming over our heads. And, now more than ever, we need writers up to the task of convincing us of this. Not just competent writers, mind you; from these you'll get the venerable, well-annotated but otherwise dehydrated boilerplate itemizing the hits and misses of Astronomy 101's usual suspects: ancient Greeks, Moorish scholars, Copernicus, Galileo, Newton, Lowell (for comic relief) and finally some pro-forma paeans to Einstein, Hubble, Hawking and (with an asterisk) Sagan.Now, while all this is fairly serviceable stuff, it conveys nothing of what we layfolk dearly want from science: our own personal place in it. We want to connect -- to log on to eternity. And that's where Clifford Pickover steps in. His new book, The Stars of Heaven, ostensibly concentrates on stellar astronomy -- the lives and deaths of stars. But anyone who has ever read his previous books will expect -- and receive -- far more. Pickover's expansive field of view reveals the nature and mysteries of stars in their broadest, deepest possible context -- from the edge of the observable universe and beyond to the restless shadows of human consciousness. 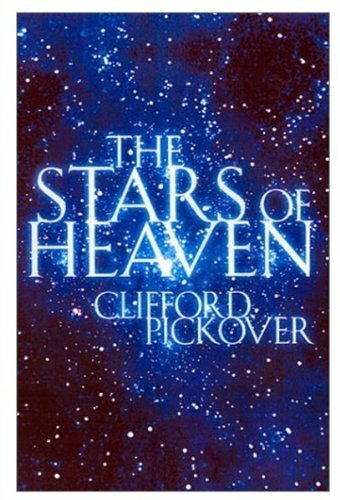 Astrophysics, cosmology, philosophy, religion, art -- all of these seamlessly enrich Pickover's answer to our seemingly simple "wish upon a star." But don't get me wrong here; The Stars of Heaven is no ponderous block of academic marble. Pickover delivers the goods like a friend, happy you've asked him to stop over for a chat about some of his favorite ideas. He's an avid sci-fi fan, and he delights in actively engaging his readers, so in this book (as in various others of his) he creates for us a space adventure all his own, complete with wacky characters, funny asides and lightspeed plot-twists but all to make his main points memorable -- and meaningful. Sometimes, to crystallize a point, Pickover includes a simple equation or two, but these are painless and few; in fact, they serve as handy landmarks should you wish to backtrack and refresh. But always this is a personal journey for the author -- a chance to reveal why he delights in heavenly mysteries, scientific and otherwise. You'll especially get a sense of this in the "non-fiction" section of each chapter, where he distills and develops themes introduced in the sci-fi segment. And this may be the most valuable element of the whole book: a glimpse into not only the mysteries of science but also the scientist -- why he does what he does, how his discoveries and unanswered questions square with his own aspirations and beliefs -- and why he'd like to share all this with you. Indeed, this is what we need, now more than ever, if we are to live beyond fear of the unknown. This book is very well written in a clear style that is enjoyable to read. It is technical in its details, which for me was a plus. The treatment of the standard evolutionary myth of how life arose from non-life is quite illuminating. In response to the Dec. 7 review, the probability of throwing a seven in a game of dice is 1/6. The total number of outcomes for throwing the dice is 36 and not 22. The fact that I throw a "one" first and a "six" second is to be counted seperately from the case of throwing a "six" first and a "one" second, even though they make look like the same result. There are six possibilities on the first throw and six on the second, for a total of 36 possible outcomes. The number of outcomes for "seven" is six (1,6) (2,5) (3,4) (4,3) (5,2) (6,1). With six possible outcomes equalling "seven", and 36 total possible outcomes, the probability is thus 6/36 or 1/6. Maybe you should reread the book and learn a little more on probability theory. Regardless of one's religious faith (or lack thereof), one has to admit that the worldview of the 19th/20th centuries is aging badly. The belief that all of reality is mere matter and that random, undirected processes produce complexity has been battered by advances in just about every discipline one can think of: mathematics, Physics, chemistry, genetics, information theory, and even Psychiatry (e.g., Dr. Jeffrey Schwartz's discovery that OCD patients are able to use their minds to re-wire their brains) have left the 20th century's mechanized world view in tough shape. This book is a good primer about the logical fallacies of the old world view. Randomness simply doesn't produce order without the prior existence of information and a directed process. There is no mention of God here; if you are a resolute atheist, like the reviewer from "USA," feel free to propose a universe guided by aliens from another dimension. But whatever one's philosophical persuasion, one simply can't defend the old world view by calling its critics "religious." This is an excellent book to get a feel for the problems with materialism. What will take its place in the future remains to be seen. But one thing is for sure: we are on the verge of a massive paradigm shift that dwarfs anything else that ever rocked the intellectual world. The problem I have with this book is the assumption that "accident" and "self-organization" equal the same thing. 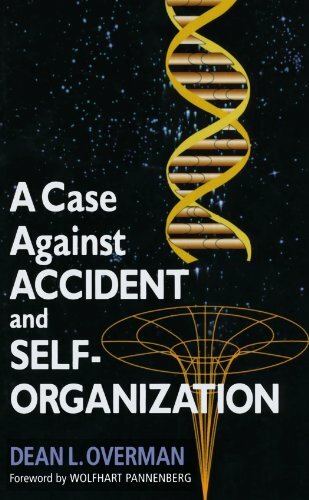 Overman has written the obvious truth in the matter of self organization and accident as it relates to any origin of life scenario. What he clearly spells out in his book cannot honestly be disputed even though he humbly suggests that he is only presenting a "case" that should be evaluated by reasonable persons. Of course this subject is often NOT evaluated by reasonable persons but by fanatics and people with preconceived mind sets on one side or the other. Reading some of the reviews here I find the usual practice of building straw men and setting fire to them. Overman is not a fanatic with an agenda but he does have an ability that many scientists have long lost in the continuing debate of theism v. atheism. Logic and facts are supposed to be the realm of science but when words are twisted and redefined one can only assume that the truth is not the final goal but rather the promotion of an ideology. The facts however speak for themselves and twisting them does not change reality. The essence of the book is that biological laws do not spring "accidently" or even on purpose from the laws of physics and chemistry. Self organization of a biological system is impossible. Of course theists have long believed in miracles so I supposed that atheists are entitled to believe in them as well. The point is that miracles are supposed to be "unscientific" yet now materialistic science believes in them and they peddle their wares as if they were the latest thing produced form rational minds. The key word is "information". Information theory has nothing to do with the laws of physics except in the sense that the words printed in a book relate to those laws. Yes, DNA and RNA obey chemical laws quite obediently and so does the chalk that the teacher uses to write her lesson on the blackboard. In fact the whole universe and everything in it obeys those laws. But, DNA as it is used in an organism in real life is not organized according to the laws of physics. As an example, if we took some square blocks that were identical except that each one had a different letter of the alphabet printed on it we could soon see that we could arrange them in any order we chose and still not violate any laws of physics. Whether they were arranged to spell "building blocks" or "dingbats" the laws are not violated. DNA is arranged the same way. It contains useful INFORMATION. The laws of physics have nothing to do with that arrangement. DNA can be ordered in any arrangement just like the blocks, and still obey chemical laws. The information comes from somewhere but not from the laws of physics. It cannot arrange itself accidently into any meaningful order because the information must be interpreted, translated and actually used in a practical way in order for life to come forth. Time is the worst enemy of the materialist fanatic. He does not have infinite time for his monkeys to type endlessly on their trillions of typewriters. He is limited by the age of the universe and by constraints brought about by extreme temperatures and so forth. Only one who believes in miracles can believe that the volumes of specified and instructive information contained in even the simplest conceived biological cell came about by accident. And evolution cannot help him because the information is the essential ingredient of life and must exist before evolution can even operate! The catch all phrase "evolution did it" does not work here. The fanatics will have to try another catch phrase now in order to perpetuate their delusion that there is no God except evolution. Of course the latest thing now is "the edge of chaos". There are interesting books on this with interesting pictures. Some (like Richard Dawkins) apparently think that if you give your audience clever computer generated pictures they will think that you have actually produced life without all of the mess. Dawkins is more of the "evolution did it" crowd however. He is now being left behind by the "chaos theory" people. Of course they cannot produce information of the type in question either but the pictures are pretty anyway. In a nut shell, all of these new ideas brought forth by people playing with computers ignore the source of information. They happily punch their keys and create their programs with their own intelligent input and their "simple rules" and still they cannot produce information but only order. Of course even the wind can stack our blocks into some type of order. But that order has nothing to do with meaningful information that is produced by the teacher writing on the blackboard or the child who arranges the blocks to spell out "information is not physics!" There is much more to the book and it is written so that people can understand it without resorting to bind faith in the opinions of experts who for some reason do not care for the idea that there just may be a God and they may not be one. This is a very well written, well explained, well researched story of the WMAP probe that is providing us with precision measurements of the Cosmic Microwave Background. The author presents the story in a classic timeline, starting before Penzias and Wilson, proceding through COBE, and climaxing with the WMAP results. The author focuses on the people and events, more than the science; but does not neglect the science either. We learn about the personalities, rivalries, friendships, and feuds of the people involved. We also learn about the science of the big bang, and the importance of the miniscule fluctiations in the CMB. I found some of the pages to be a little dry; but nothing that caused me to yawn or skim. Overall the book moves along at a good pace, and it fun to read. I was just a little annoyed by the author's minor tendency to sensationalize. For example, he started the book with a flash-forward to the end where one of the investigators (Dave Spergel) is poring over his data in trepidation about making a "shocking claim". We don't find out what this shocking claim is until the end of the book, where we find out that, in fact, the flash-forward was to a period when Spergel was speculating about the results based on data that was not fully analyzed. Anyway, it's a fun read and certainly worth the time and money. It's good to know facts like the universe is 13.7 billion years old, that the hubble constant is 71km/s/mpc, and that the first stars turned on about two hundred million years after the big bang. 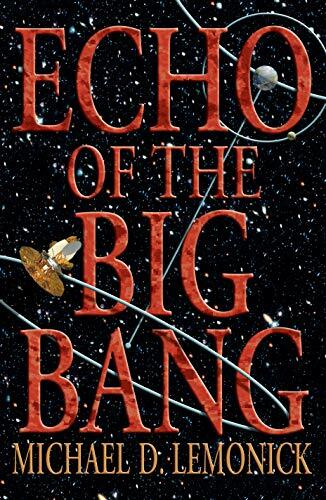 Michael Lemonick's 'Echo of the Big Bang' is a very interesting text that weaves some of the recent history and personality of science into one of the more interesting astrophysical discoveries of modern times. Okay, so these are fairly simple observations. What do they mean and why are they important? Lemonick's book takes a longer view toward astrophysical cosmology (as opposed to the more philsophical and theological kinds) - this is a relatively new branch of one of the oldest sciences. Astronomy has been important since the earliest days of literate humanity, and possibly even precedes literacy - charting the stars for theological/religious/superstitious reasons as well as practical reasons (seasons, time keeping) have always been important. However, it has only been since the Enlightenment that major attention has been given to analysing the different components of the sky, and while broad-based interest in the constitution of the universe has been present in philosophical an intellectual history, it has only been since the twentieth century that science has taken on the task of explaining the large-scale structure of the universe. This has led to many fascinating turns, many of which have played out in the popular press, like the astronomic struggle between the Steady State theory and the Big Bang theory. Lemonick recounts the various near-miss discoveries of the CMB radiation, particularly the various Bell Lab accounts, the various mis-diagnoses from observational astronomers around the world, and finally efforts from ground-based and satellite/above-atmosphere observations to lead to the inescapable conclusion that, whatever it was, there was something out there creating fairly general and stable readings on various instrumentation. The greater part of the text deals with the formation of the latest mission, which led to the discoveries listed above. 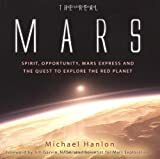 Detailing the planning, the formation of the team of researchers, the budgetary issues, the set-backs due to changing NASA priorities and fortunes, and the personality quirks and conflicts that inevitably arise in projects, this is a fascinating glimpse of the human side of the scientific enterprise. The formation of how scientists even decide what to look for and how to look for it is interesting in and of itself; sometimes the scientific process doesn't seem so, well, scientific. How could it be, being run by scientists who are first human beings? Lemonick also shows some of the aftermath of the discoveries (still a bit new at the time of the writing of this text, or of this review) - he references John Horgan's assertion that all the important discoveries of science have been made; I cannot help but think here of similar statements being made at the end of the nineteenth century, when active speculation about closing patent offices existed as 'everything that can be invented already has been'; history has a sense of irony in that it was a patent clerk (Einstein) who would prove this to be an example of classical physic's hubris. But Lemonick explains the emphasis in astronomy is already shifting; more headlines are made from discovering possible planets around neighbouring stars than grand theoretical constructs or larger-scale explanations. Where science really goes next, in the next decade, is a mystery; much more so is the direction for the next century and beyond. Don't be put off by the size and modest production of of this book. This is extrememly well written. There is an honest attempt here to communicate as clearly as possible to the general public. Yes, given the quality of the writing there should have been more diagrams and more money spent in promoting it, but this book is still much better than anything Hawking has written for the general public and certainly much better than Smoot's ...effort on COBE. But it is too short and I wish the author had spent more time on the history of earlier attempts to measure the CMB. I think he was afraid of boring his audience, but I think a little more technical and scientific detail, maybe even a few equations, might have made things clearer. Also towards the end the author introduces ekpyrotic universes without much clarity and he is not very clear on the actual nature of the "acoustic" peaks except to say that they were expected to be seen if the universe was finite and curved...which it apparently is not. Excellent general discussion of the engineering problems involved in actually trying to build something. No book is perfect but if you are interested in the WMAP this is well worth buying. There are several other experiment going up in the future....a European MAP, an infrared background radiation scanner, as well as a series of polarization mappers and gravitational wave detectors. I hope the author stays on this beat because in my opinion he is one of the best science writers for the general public that I have read. Henrietta Leavitt's "...study was ignored, in part because the researcher was a woman and thus unqualified to be a "real" scientist." (Lemonick's quotes around 'real')(p. 22). "...observational astronomers don't tend to spend much time studying up on theoretical physics." (p. 38).